LonDumb – Part III | Enough Talk, More Writing! So anyway, that kind of happened, and now I’m inside. Show my pass to the security guards inside. Eyes light up. All genuflect while I stroll through the doors. Lounge area. Couches. Chairs. Tables. Posters on the walls. Bar on the far. Over I go. Actually, I need the bathroom first. See the sign. Swoop. Not sure why I also go to the bathroom in places when I first get in. Sometimes, when solo, it’s to suss out where I am and what’s my plan, almost like a buxom I flock to for comfort (can you tell I’ve being reading up on Freud?). Most of the time it’s because I need the bathroom. This time, it was a mixture of both. Bathrooms are in a closed off hallway. Each a single. Get in. Lock the door. Do my business. Take out my phone. Check if it’s getting signal. Slight sign of wifi being picked up. Phone won’t receive calls in England but at least I can email now and again. See an email from Rob: Where are you? Try to reply: In the bathroom, where are you? Email failed. Balls. Not enough signal. I’ll try out by the bar. Zip up. Wash on. Open the door. Hmm. Why is this lock not opening? Try that again… Open the door. Nope. Lock now just turning around. Sweet Jesus, not again?! Why am I always locking myself into bathrooms. Off the top of my head there was that one in Mexico that I was locked into for ages and then there was this one in Cork at a party where I got locked into the tiniest bathroom ever, started to run myself a bath to cool down trying to curb the freak out when I felt claustrophobia kicked in. Thankfully management of the hotel broke down the door… Just as I was getting into the bath. Naked. But that’s for another day. Now, I’m in this bathroom in the O2, pondering how to escape. Bang. Bang. No one outside. Yelp out a hello. Nada. Clear my throat. Bellow out a HELLOOOO? Nothing. Bellow out another EXCUSE ME I’M STUCK! Nada. Another bang or two. Knock. Knock. Nah. No one? Try the lock. Just swivels in a circle. Hate these rubber locks. Always the same ones that catch me. Hear a bing. Phone. Email. Rob: Are you here? Email back: Yeah, stuck in the bathroom by the bar, send help. Send. And. Failed. Funk! Sit down on the bowl. Think. Nothing. Bang again. Hear a noise outside. Sounds like people! Help! HELP! I’m stuck! Quick!! I think the show is starting soon, get me out!!! Nobody comes to my aid. Did they dodge me? Were they actually outside or is there a vent somewhere? Am I even here? What’s going on? Punch slap myself in the face. Ouch. Here all right. Now cop on. And then I try the lock again, and… The funker just opens like normal. Dirty little rubber duck. Freedumb! Dust my flustered head down. Stroll back out to the bar area. Catch the eye of the bar lady who I saw as I was walking into the bathroom. Gives me a look as if to say You were in there this whole time? What’s wrong with you? I mouth back Nothing, nothing is wrong with me. She says back ‘Pardon?’ I say ‘Oh, balls, I mean, how’s it going? Could I get a drink please?’ ‘Sure, what would you like?’ ‘Whatever that bottle is you’re holding, I’ll have a glass of that please, you know me, no fuss at all.’ So now, I’m strolling around the bar with a glass of rosé wine. Like a real man. Rosé on! Bump into two guys I know, Australian lads who wrote with Rob on his new album. Ask me was I there long? Nah, just a minute or so, definitely didn’t get locked in the bathroom or anything. Tell me Rob was looking for me. Oh right, yeah, I was meant to be here earlier to hang out. Not sure where he is now though, might be in his dressing room still. Oh right, I’ll go have a look. So I walk through double doors. Big burly bouncer on the other side. Ticket? AAA. Takes a knee. Waves me through another set of double doors. Corridors to my left, right and straight ahead. Hmm. No clue which way is which. Walk right. People run by. Nod hello. Sip some wine. End of the corridor. Take a left. Security wave me through. Bit of banter like I know what I’m doing. All access. All over the shop! Hear a lot of noise now from close by. Crowd is chanting Rob’s name outside. Security everywhere. People on headsets. Not sure where I’m meant to be going. Oh yeah, Rob’s dressing room. Although, the gig was meant to have started by now. What to do? Go over here. Down this corridor. Not sure where this is. Nor if I should be here. Oh. Apparently my pass means I’m golden. And now I’m going out the entrance. Through a curtain. Hmm. Looks like the entrance to the stage. How about I pop my head out these curtains? Jesus. Stroll out through the curtains. See the whole of O2 staring back at me. Place is massive. Stage in the middle. Seats higher. Tiers higher. And then more tiers for fears higher again. Huge. Packed. Pumping. Crowd is raring. People looking at me. Think this is where Rob is meant to come out. All chanting his name: Murk! Murk! Murk! I mean… Rob! Rob! Rob! Although I do hear someone calling a variation of my name. Murk… Murk! Turn around. Who’s that? Through the curtain. Rob. Hey boss. Waves me back inside. How’s she cutting? Where were you? In the bathroom? Locked? Where? Doesn’t matter? Pumped? Pumped. Show slightly delayed. Come back here until it’s on. So we go back towards the dressing room section. Have some backstage banter, as they say. Meet the family. Ask where’s Kailand. Can’t believe that happened. Wish her the best. OK. Time to go. Dance on boss, see you out there! Rob goes one way. I go the wrong way. Head back the other way. Realise again I’ve no clue where I’m sitting or meant to actually go. Hang out here? Go upstairs? Actually, where’s my seat? Ask a steward. Takes a look at my ticket. Apparently I have no seat. I can literally just go wherever I want. Arena is my oyster. Oh Betsy! Where was that bar again? Head upstairs. Box. Bar. Not sure. But it’s a nice spot. Watch the show. Some gig. First time seeing Rob perform. Unreal. Some entertainer. Start to finish. Some man. Must be savage to do that in front of an audience that size. Dominated the place. Some presence on stage. Figuratively grabbed the place by the balls and didn’t let them go until the very end. Meant that in a good way. Did it come out in a good way? In a good way. Never seen a crowd loving it so much. Whole arena getting into it. Dancing. Prancing. Chanting. Arms waving. Singing along. Conductor on stage keeping them all going. It. Was. Mighty. Twenty songs or so later – a fair whack of songs or is that the norm? – and the show is over. Party, however, is not. Chilling for a booze après in the box. Gibber with some TV folk. Gabber with some royalty. As in actual royalty. Backstage banter once again. Guinness is a good ice breaker. Duchess, Lady, pleasure as always. And then. I had to bounce. Catch the last tube. Early meeting the next morning. Sensible head. On. Especially at this was only the first night. I would be back again two days later for round two. Yee huu. A. Duu. This time I showed up earlier. Did some backstage strolling. Here are a couple of backstage photographic highlights of my favourite singers. Pure quality, to be true. Anyway, I knew my way around this time as well so all was good. No locking one’s self in the bathroom or anything dumb like that. I did somehow end up in the group huddle with Rob and his band right before they went on stage. Said a few words. Team talk. Out ye go lads and ladies, break their legs, do it for the parish, that kind of thing. Basically just swooped a team talk from playing soccer back in Ireland. Worked a treat. Show was even mightier than the first. Great night. Dancing up in the box with family and friends. Le booze flowing. Spirits high! Couple of tipples downstairs afterwards. Mingling. Hobbing. Nobbing. Chatting. People I would see on chat shows on TV the next night. Comedians. Actors. The likes. Talking to a guy Harry at the champagne bar. Sound unassuming kind of guy. Asked him what he did? Singer. Oh yeah? How’s it going? Shrugs, not too bad. Modest chap. Well best of luck with it boss, hope it goes well, now if you excuse me, I must go fill up my glass. Find out that his band One Direction are already doing pretty well. 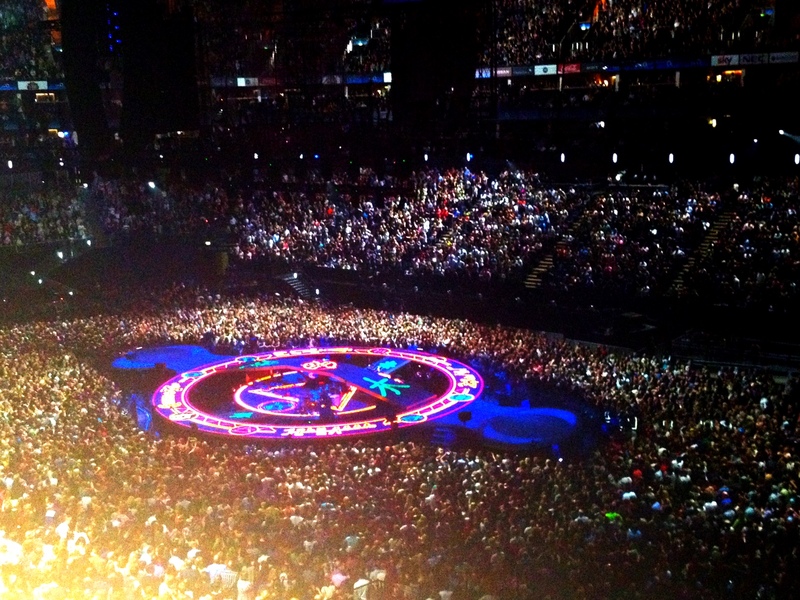 Probably the biggest band in the world at this moment? So my best wishes were needless? Oh right. Hmm. I might be drunk. Where are we off to next? This looks like it’s winding down. Apparently Rolling Stones are moving in. Literally. All their gear being shipped in for their run of gigs. Meaning we have to bounce. Found the Aussie lads and Americano Dylan. After party, part duu? Car. Driver. London. Nightclub. Not sure where. Mayfair? Cool. Packed. Hot. Heaving. Fun night. Fine morning. Now I’m rambling. Must still get to my own stand-up gigs and why I ended up eating pages of paper. Fun times. Part IV… On! Read RanDumber -> SNAP HER UP! RanDumber for the Kindle -> SNAP ON! Great account from the other side of the curtain I was stage side on the Saturday night getting told off by Rob for trying to chat during a song coz I had a pressie for a Teddy and adrenalin/hormones took over ageing fan girl cringe on! I think I remember that. Let that adrenalin flood out! Pingback: LonDumb – Part IV (Or… Kneed A Dwarf In The Face.) | Enough Talk, More Writing! Pingback: LonDumb – Part V (Or… Why Did I Eat Paper?) | Enough Talk, More Writing! Pingback: LonDumb – Part VI (Or, Am I Being Deported?) | Enough Talk, More Writing!